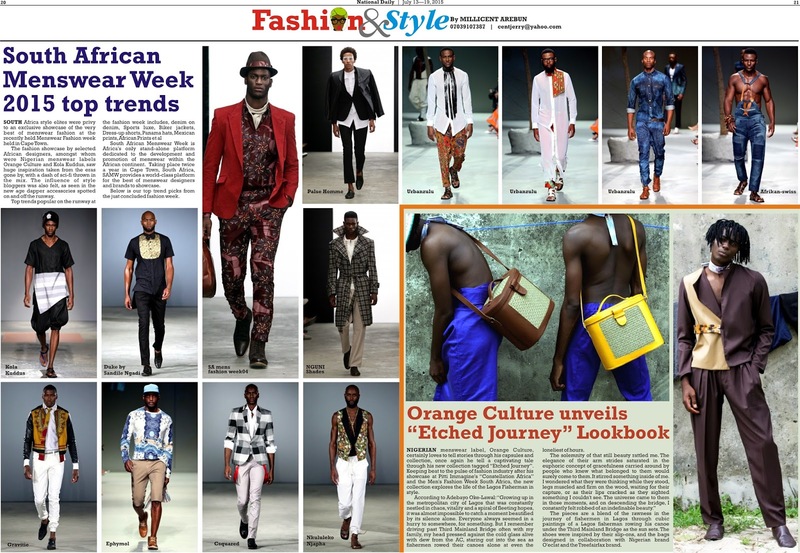 Hi darlings, recently on my newspaper Fashion and Style pages, on the National Daily Newspaper in Nigeria, we reviewed the top male fashion trends for the season, witnessed at the South African Menswear Week 2015. I thought to share it with YOU my male blog reader, as I so rarely have male fashion posts and style tips on the blog. South Africa style elites were privy to an exclusive showcase of the very best of menswear fashion at the recently held Menswear Fashion week held in Cape Town. The fashion showcase by selected African designers, amongst whom were Nigerian menswear labels Orange Culture and Kola Kuddus, saw huge inspiration taken from the eras gone by, with a dash of sci-fi thrown in the mix. The influence of style bloggers was also felt, as seen in the new age dapper accessories spotted on and off the runway. South African Menswear Week is Africa’s only stand-alone platform dedicated to the development and promotion of menswear within the African continent. Taking place twice a year in Cape Town, South Africa, SAMW provides a world-class platform for the best of menswear designers and brands to showcase. Would you let your man, brother, relatives or friend or frenemy wear these trends? Let me know by leaving your comments below.